Managing digital strategy for a healthcare provider or organization is no easy feat. Between planning out social media, writing blog posts, analyzing your competition, and creating original content, the workload can quickly start to feel overwhelming. That’s where content curation comes in. Content curation (as opposed to content creation) is the process of collecting various pieces of content created by other sources that match the voice of your brand and are suitable to your audience. Could you simply add curated content to your strategy blindly? Sure. Is that advisable? Of course not. Before you set off on a content mining journey, you need to know a) what your brand wants to say and b) what your audience wants to hear. Each and every time you approach a new piece of content be sure to stop and ask yourself a few questions first. Is this interesting? Is this helpful? Can I trust the source? How will the audience feel when they see this? Just because you didn’t create the content doesn’t mean that you can bow out of responsibility when sharing it. You are a cosigner to everything you post so choose wisely. Remember that your audience is coming to your page because it provides value to them in one way or another – your content should reflect that. 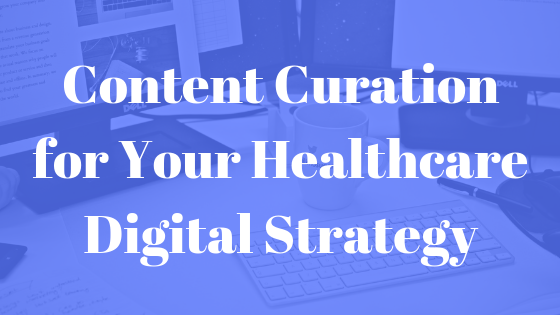 One way of rounding up your curated content is by visiting blogs that specifically write for healthcare marketing or for your medical specialty. If you are starting at square one, set up Google Alerts for what is most important to you (ex – “patient engagement”, “allergies”, “mobile health”) and have content delivered directly to your inbox. After a while you will start to gain an idea of which sources you prefer and provide the best content. If you are still finding yourself feeling stumped, pay a visit to the social media pages of some of your competitors. What kinds of curated content are they posting? How frequently? What sources are they drawing from? Gain some inspiration, try stuff out and see if it works for your particular strategy and content mix. Speaking of content mix…you need one. You, of course, have services that should be promoted on a regular basis through your social media channels. However, seeing the same thing day in and day out will bore your audience and cause them to start tuning out. That’s why you need content curation to add to the mix. When planning out the marketing for each month, make sure you have a healthy amount of curated content to keep it lively and interesting. Remember that your content should follow the 80/20 rule – 80% of your content provides value (education, insight, humor…) and 20% of your content is self promotion. You can still hype up a service you want to draw attention to or a new piece of equipment you just added to the practice. No shame in the game! Just make sure that this kind of content does not overpower other content that provides the value and benefits keeping your audience engaged. Need help with your content or overall digital strategy? Contact us here!